Paul Rogers and Liz Wilcox were 5th in the Te Awamutu Christmas Tournament on Saturday 17 November. They were 1st N/S in the morning and 3rd N/S in the afternoon with very consistent scores in the mid 50s. Liz and Paul were also the top Intermediate/Open pair overall. 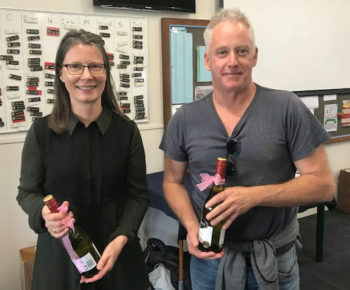 Leonie Pritchard and Mark Bendall (pictured right) finished among the prizewinners in the Waikato-Bays Intermediate Championship League, played over 9 weeks during the year. They were 7th overall, another very consistent performance.